Most people, even those with large kitchens, eventually find themselves in need of kitchen organization tips. When we bought our house, the kitchen was five times larger than our old one, and I was giddy about all that extra space. Eleven years down the road I find myself wondering where to store the gadgets and food props, not to mention all of the drinking glasses that seem to multiply whenever I turn my back. While it’s one thing to say “maximize your use of the space you have,” it’s quite another to understand how you can do that. These ten practical, reality-based kitchen organizing tips will show you how. 1. Hang things. Storing spices in a rack requires wall space that many kitchens, including my own, lack due to windows. Using the clips from a broom/mop holder, Barry and Christy mounted spices inside a cupboard door where they’re within easy reach. 2. Unbox items. As for trash bags, Simply Organized literally thought outside the box to come up with the idea of hanging them from curtain rods mounted under the sink. Both solutions show that by ditching traditional organizing methods (like a spice rack, or leaving things in their boxes), you often find a solution that works even better. 3. File vertically. Meanwhile, The Wandmaker’s Mother decided to go vertical with boxes of plastic wrap and aluminum foil. By mounting a magazine rack inside a cupboard door, she freed up a drawer. 4. Use rail organizers. Keeping counters clean and clutter-free is a challenge many of us face. Christina at No. 29 Design solved both problems by installing a railing along her backsplash. Now she hangs wire baskets to hold pretty canisters of ingredients, pots of fresh herbs, and more. It’s a beautiful and functional solution. 5. Use both sides of the doors. Tired of the visual clutter on the front of the refrigerator, Chelsea at Two Twenty-One turned the inside of a kitchen cupboard door into an attractive organization station. Clothespins hold bills, hooks hold keys, and magnets hold things like photos (thanks to the metal sheet she thought to install first). So clever! 6. Group small items. 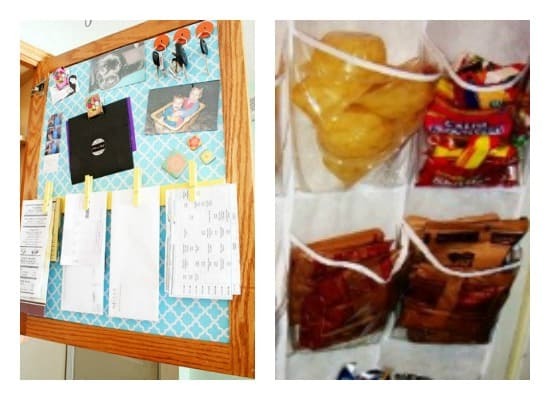 The Money Saving Queen thought up a new way to use space, too: she hung a plastic shoe organizer in her pantry to hold snacks, boxes of Jello, and those packets of mixes that always look like a mess. 7. Use hooks. Remodeling is expensive. It’s far more affordable to use dead space to increase your storage area. That’s exactly what Julie at The Hyper House did when she began organizing her baking nook. Adhesive hooks inside cupboards make it easier to find her stand mixer attachments and freed up room for her neatly stacked baking pans. 8. Think vertically. Jennifer at The Chronicles of Home also saw a way to put dead space to work by hanging floating shelves on the side of her refrigerator to hold frequently-used items. Even if your fridge doesn’t have a cabinet surrounding it, you can screw shelves onto 90-degree magnetic mount catches to hold up to 40 lbs. per shelf. 9. Make corners efficient. Lazy Susans were initially designed to make it easier to pass food around the table. 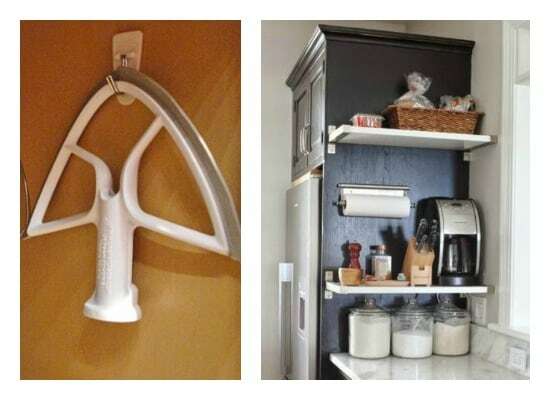 Emily at Decorchick put them to a different use by installing several in the corners of her pantry. Now she can easily find what she needs, and her pantry looks marvelous! 10. Stack things. Kevin and Amanda repurposed items, too. 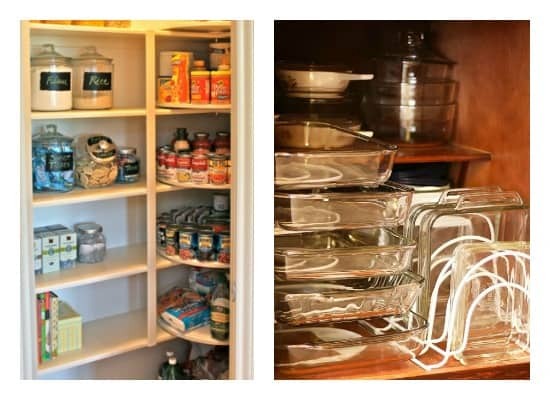 Using desk sorter trays they’ve tackled the clutter in their baking cupboard. Now they no longer have to pull out every baking dish to find the one they’re looking for, and their cabinet holds more, too. 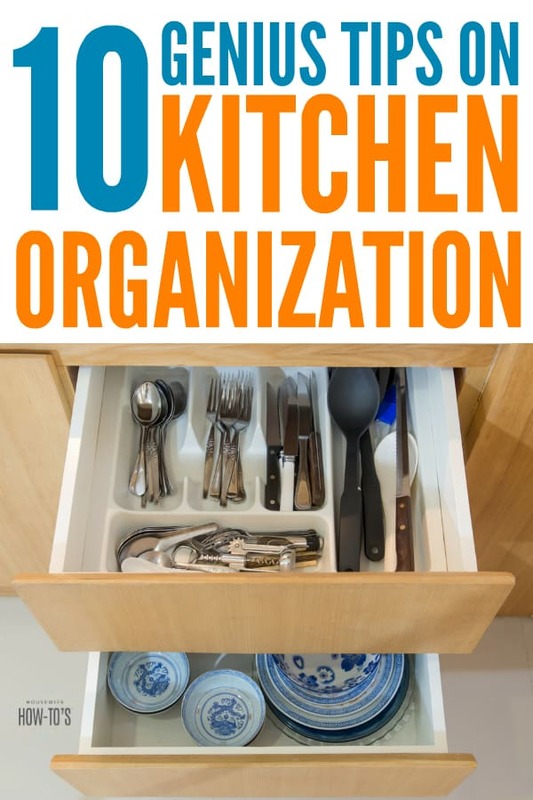 Need more kitchen organization tips? Check out these great ideas. Thanks for the suggestion of storing the spices inside the cabinet doors like that. What a great way to have them handy, easy to find and access, as well as stored away from the heat of the stove or oven. Keeping them off the counter and away from heat or light is a good thing! We’ve also found that purging unused kitchen items once a year has helped tremendously too! Absolutely! That’s what I’m doing between Christmas (when I always get new kitchen stuff) and New Year’s. Great list! I really like hanging coupons and recipes and things inside my cupboards! Thanks for sharing on the Small Victories Sunday Linkup! That’s where I keep my most frequently-used recipes, too! That’s an excellent idea about using it in the mudroom, Linda! Isn’t that clever? 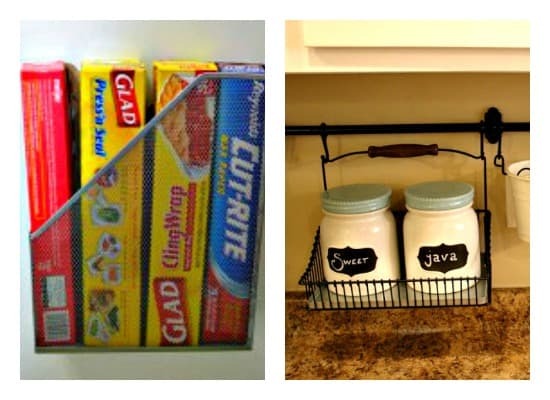 And you can always find those letter racks at Goodwill or garage sales. People don’t seem to use them for letters very long. You’ve picked out some excellent tips to share here. I love lazy Susans and the sorter trays are great. Thanks, Barbara! Aren’t lazy Susans the best? Great ideas here. 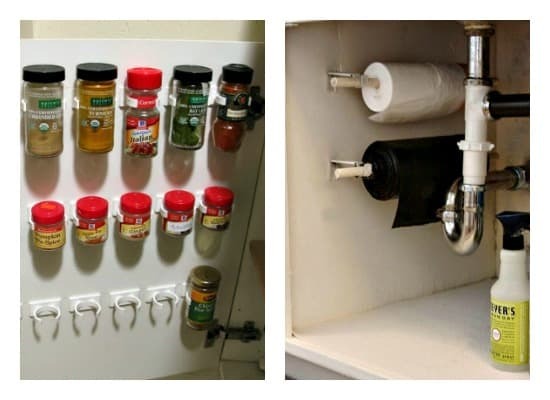 I have a very badly laid-out kitchen so always looking for organisation hacks like this. Thanks.